One of my favourite things to have for breakfast is a smoothie. And not just any old smoothie. And not just smoothies that you drink. Oh no. Breakfast is the most important meal of the day, right? So I don’t want to slurp a smoothie down in a hurry. I want to savour it and enjoy it’s goodness for as long as I can. And that’s where the smoothie bowl comes in. I love smoothies that are thick and creamy and can only be eaten with a spoon. 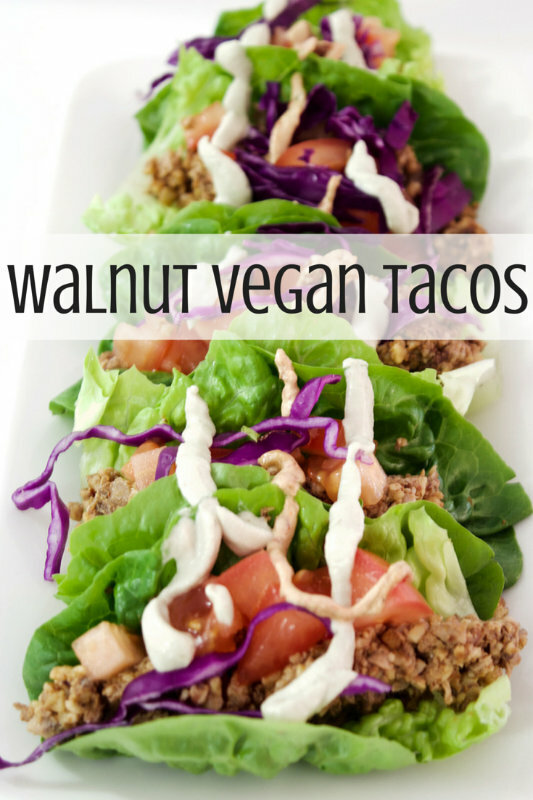 Pour it into a big bowl and slowly eat it with a spoon. 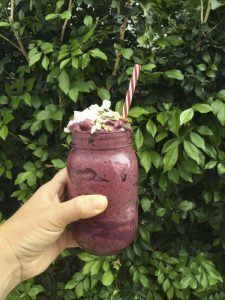 Most of my smoothies are based around a banana, berries, sometimes oats, coconut water or almond milk, some macqui powder and protein powder. But I want some extra bang for my buck. I want something that’s going to give me as many nutrients as possible and add flavour and something special to my smoothie bowl. Something to add onto my spoon, something to chew on in between the creaminess of the smoothie. That’s where my seed crunch comes in. I use to make my smoothie bowl and on top I’d add a teaspoon of this and a teaspoon of that. But ain’t nobody got time for that. My solution? 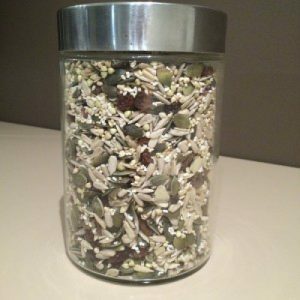 A big batch of seed crunch that I store in a jar, sprinkle a tablespoon or so on whatever I want – smoothies, milk shakes, ice cream. Oh yeah, this stuff goes from morning to night with ease. Actually, it does it better than me. So what is in this seed crunch. Is it really just seeds? Is it just for the birds? Will I start tweeting like a robin? I always hear the same dad joke every time I tell someone about it. “You’ll start tweeting like a bird soon.” Well if you saw my Twitter account you’d know that I already do. 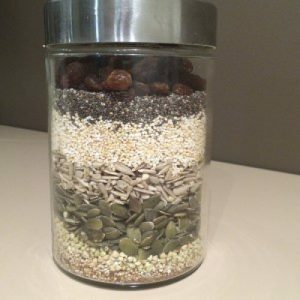 Most of these ingredients can now be found in supermarkets too, so whilst it may look like this recipe contains some crazy vegan food, it’s just your regular seeds that birds eat. And humans. Oh yes, humans eat this too. These seeds provide a lot of necessary vitamins and minerals to keep you healthy and well. And that’s what we all want, isn’t it? To be healthy. Oh, and to eat a smoothie with a spoon. Any combination of seeds can be used. Add chopped nuts for variety.